NEW YORK (CNNMoney.com) — You may soon find yourself paying more for your morning coffee – if you aren’t already. 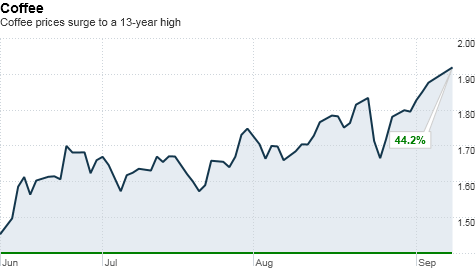 A trifecta of bad news has sent coffee futures soaring 44% since June, and companies such as Dunkin’ Donuts, Green Mountain and Maxwell House are passing on those costs. Bad weather in South America is threatening crops. Brazil and top exporter Vietnam are talking about hoarding their stocks. And U.S. stockpiles are reportedly at 10-year lows. That means higher prices for U.S. coffee companies, which, in turn, may mean higher prices for consumers.